If you are participating in the Adults Summer Reading Program or the Kids Summer Reading Program and you don’t know what to read next, here are some reading suggestions. 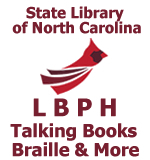 The list is divided into downloadable books, large print books, and braille books. The books on these lists are intended for both children and adults. This entry was posted in Adaptive Technology, Adults Summer Reading, BARD, braille, collection, events, Kids Summer Reading, large print, Reading Suggestions, resources, summer reading, talking books and tagged Adult Summer Reading Program, BARD, BARD Express, BARD Mobile, braille, Crafts, Digital Books, download, Downloadable Audio, Downloadable Braille, entertainment, fun, Hobbies, How To, Kids Summer Reading Program, large print, libraries, nc libraries, nclbph, north carolina libraries, North Carolina Library for the Blind and Physically Handicapped, reading, reading list, Reading Suggestions, summer reading, talking books. Bookmark the permalink.